Anand Neelakantan’s debut novel, Asuras- Tale of the Vanquished, is a markedly different take on mythology involving Ravana’s side of the story. The book attempts a subverted effort at explicating the philosophies of good and evil as a matter of perspective. Literary Analyst Kirtana Krishnan, talks to the author about his life, love for cartoons, telling stories and the (implied) demon causing all the trouble in political intolerance today-the media! Kirtana.K- How was growing up for Anand Neelakantan? What did you observe and what influenced you? 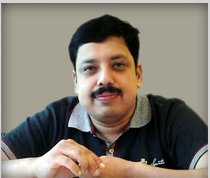 Anand Neelakantan- I was born on December 5th, 1973 in the historical city of Thripoonithura, a suburb of Cochin. Mythology was always a part of my growing up. Discussions on mythology, folk tales, temple festivals, performing arts, classical music and literature and of course reading- the entire town lived on these. Schooling was done at Chinmaya Vidyalaya, Thripoonithura till 5th standard which made my roots in tradition stronger. Later, when I moved to Fact High School, which had a strong culture of encouraging literary and artistic talents of the students, my knack in storytelling and cartooning developed. Infact, most of the prizes I had won during my school and college days were for cartooning, rather than story writing. After my college days in Government Engineering College, Trichur, I was successful in getting my cartoons published in some Malayalam magazines. I have worked in various jobs after college and for the last 13 years I am with Indian Oil Corporation. Presently I am a Manager in Indian Oil Corporation, Belgaum Divsional Office, Karnataka. Mine is a transferable job, and now I live in Belgaum with other five members of my family- My mother Chellamal, spouse Aparna, Daughter Ananya, Son Abhinav and my Labrador puppy- Jacky the blacky who is all of 8 weeks old. K.K - Jacky the Blacky sounds adorable. But if cartooning was your forte ,how did you get involved in writing? What was your experience writing Asura-Tale of the Vanquished? A.N - Writing always has been my first passion. Rather, I would say, storytelling has always been my passion. Writing is a tedious process, whereas storytelling is not. Writing Asura was an emotional and turbulent journey. Sometimes, the characters will come and grip the writer and take him through the lanes and paths that he would have seldom planned to go, or he wants to go, when he starts writing. I had to get into the mind of character called Bhadra, who is my own creation and not found in any version of Ramayana. Then I had to think like the defeated Asura king- Ravana. Both these characters had to be presented in a totally unconventional fashion, challenging an epic which is the very breath of our culture. I have been trained in mythology to think in a particular way. I come from an orthodox family and have learnt Ramayana the way it has been told for so many centuries. Thinking it from the other side was a difficult process, something the mind refuses to do easily. Thousands of years, we have been trained to think Ravana and Asuras as evil. To think otherwise, to humanize them was a tough task. The change happened when I started hearing some forms of Ramayana told orally by various tribes, various communities. They were different from the sanitized, Brahminical version that I have learnt from my childhood in my family. 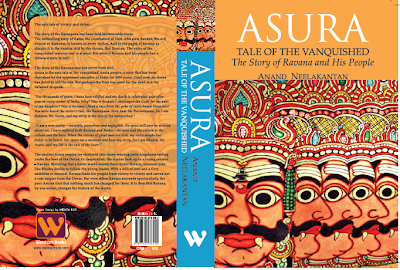 Asura owes a lot to the rich oral story telling tradition of our country. K.K - ‘Trained in Mythology’, you say? A.N - I belong to an orthodox family and I have grown up learning scriptures, sanskrit, epics etc. Ramayana, Bhagawat Geetha, Bhagawatha etc were not mere mythology. It was part of life, part of growing up. So Ramayana was sacrosanct. There were no shades of grey in the Ramayana I grew up with. Rama was god and Ravana the evil Rakshasa. Ramayana was the victory of good over evil. My thinking was trained in this pattern till I got exposed to other versions . K.K - As a first time author what did you discover about the process? As an art and within yourself? A.N - There is nothing called a first time author. Every author writes and rewrites his book many times, before he dares to send it to a publisher. Writing is the art of weaving myriad thoughts in words. That is its strength and that is its weakness. Thoughts can be free, but words are restricting. Many times, as an author, I have found that I am not able to put the emotional intensity of my thoughts into words. But writing gives discipline to my thoughts. It channelizes the emotions. As an author, writing spells freedom and restriction at the same time. Without free flow of thoughts, any writing will be just a semantic exercise. But the very act of putting the thoughts into words is equivalent to caging the thoughts- the freedom of thought is lost. A good author is like a good weaver. He has to weave his often conflicting and opposing thoughts into a pattern of words that will make sense to the reader. So an author has to be a reader first. He has to constantly watch what he is creating after each weave, after each stokes, correct here, adjust there, erase some, add some and so on. Writing after some time becomes like meditation. It is the journey into me. While writing Asura, I found that Ravana, Rama, Bhadra, Prahastha- all those characters are not separate entities, but me only. It is like seeing my own reflection in mirrors of various hues- some dark, some bright, some hallowed, some shady, yet all were same and all were me. K.K - As a first time author from a publishing perspective, what are the practical impediments in writing and getting published? Like the effect on your time, emotional inner space, getting feedback etc. A.N- The biggest problem with writing is the delayed gratification that it offers. Every human being yearns for recognition. As an art, writing offers the most delayed gratification. If a musician sings, the feedback he gets is instant, the gratification is instant. If I draw a cartoon and get it published, the relevance and gratification, both are quick. If I do a painting and hang it in my drawing room, I can see the result visually every time and any visitor to my home will make me proud with his compliments if my drawing is good. I took six years to complete Asura and a year to get it accepted for publishing. Rejection letters will break any author’s heart, especially some unsolicited advice to “stop writing crap” or “this is not publishable and does not have a story” like what I got initially. Sometimes, my 600 page draft has come back within 24 hours of sending the same with such weird comments by some junior staff of publishing houses. Once Asura got accepted by Leadstart publishing, it took a year to get it on to the stands. It underwent lot of revisions and editing. Then there is the wait to find out whether the work, I have poured my soul into meets the exacting standards of the critics and the market and that is more unbearable. A critic could destroy the life work of an author by a few dismissive words. I would only say that writing is not for the faint hearted. K.K- How has your day job enabled you or contributed towards your writing? A.N - I work for the biggest commercial enterprise of the country and that gives me immense pride, though not an equal job satisfaction. Day job is like any other day job of any average person, at times interesting and challenging, but mostly routine, drab and boring. I do not love it so much to feel passionate about it at the cost of my all other pursuits, though career achievements are also sometimes equally rewarding. I do not hate it so much to quit it, though like any middle class person, I too dream of doing so one day. At the same time, I am afraid of the day, if and when I will be taking the plunge. I write about things that might have happened five thousand or three thousand years ago. I try to make it relevant and contemporary, but not by any stretch of imagination, can I use my experience in selling petrol and diesel to write stories about Ramayana and Mahabharatha. K.K - Your favourite character is? A.N- In Asura, it is Prahastha. But my all time favourite character is Duryodhana in Oorubhanga of Bhasa. K.K- If there is one aspect of the book in hindsight you could change what would it be? A.N- I do not want to change anything in Asura. Every page in my novel is the product of the thought that I had held on that particular day when I wrote and finalized each page. I do not want to change anything. Those words are a part of me that have somehow stayed back in the page in the form of my words. Changing them would be changing me of that day, which is impossible. I would rather spend my energy on the new novel I am working on. K.K- Are you a spiritual/religious person? Do you believe in a deity? A.N- I do not have the temerity to claim that I am a spiritual person. That distinction is reserved for great souls who are very rare in the history of mankind. Regarding religion, I do not believe in religion in the sense that is used in current times. India does not have any religion. India has only Dharma, which is an entirely different term. Religion has given only given misery to mankind, whether as crusades, jihads, inquisitions, caste system, untouchability, imperialism etc. It has never set the man free. Yes, I have my beliefs. I believe in humanity and the god within each and every thing, animate and inanimate. I believe in all deities. Deities are the manifestation of human soul. They spell beauty and wisdom. Without deities will there be temples of Cholas or caves of Ajanta? Will there be sculptures? Will there be epics? Will there be Art forms like Kathakalli or Oddisi? Will there be music, will there be paintings? The divinity is in the manifestation of art. They speak to us through the carvings of Elephanta, they whisper in the Ragas, they dwell in the words of Kalidasa and Bhasa. But if you ask me, if I believe in any personal manifestation of divinity, I would point out to the concept of Shiva. I worship divinity in all forms, but when asked to choose, I feel the concept of divinity is manifested at best in that of the Nataraja. Nataraja is the eternal and the instant, the infinite and the finite, the animate and the inanimate, the Jeevatma and Parmatma, the male and the female, in that trapped form of eternal and timeless dance of Shiva in the circle of fire representing Adishakthi, the primeval energy of the cosmos. Seeing the deity in this form is seeing life itself. It sparks thoughts and creativity. K.K - How nervous were you about public /religious/political backlash? A.N- It has become fashionable within the intellectual circles to paint India as an intolerant country. Show me Khomeini of India who issues fatwas against authors; show me the government that hunts down Oshos in India, or the government that wiped off the native population or who traded black skinned unfortunates like cattle for three centuries. Did India burn any one in stakes for being a witch in our five thousand years history? Did India lead her armies to conquer other’s lands, smash other people’s shrines, forcefully convert others to one’s religion, or drop atom bombs on a different culture? Did India ever raise concentration camps to eliminate minorities or exterminate political enemies of revolution? A vicious cycle has started now because of some people in the media who want to create some sensation by quoting some lunatic fringes verbatim in prime time media. Publicity mongers have found an easy way to fame. They just cry hoarse about being hurt due to some painting, some cartoon, some book that is written in a language that cannot be read by 98% of population and is not cared by the other 1.98 % and media just carries the story and sensationalize it-a short cut to publicity and TRP ratings. Seeing this, more of such people do the same thing and the vicious cycle feed on itself to grow bigger and bigger. Common Indians have the greatness of heart to accept differing points of view. The acceptance of my novel which is in best seller list in India plaza etc and the letters I get from my readers have only strengthened my belief in the intellectual capacity of my people. Many letters are critical, but no one has said that I have hurt their religious sentiments. People have differed with me, but they have differed with dignity and it is a healthy debate now. India has always been a country of debate and this is the land where different thoughts of humankind has met and grown. Please do not brand our country that has held the torch of tolerance for the past five thousand years as intolerant. K.K - Would you consider yourself to have a sense of humour? What do you think of the whole Ambedkar cartoon debacle? A.N- Without sense of humour I cannot be a cartoonist. I relish telling and hearing jokes. Ambedkar cartoon debacle is the creation of media as I said earlier. It fed the newspapers and TV channels with some fodder and a few TRP ratings. It gave a few politicians a chance to remind their constituents that they have not vanished into thin air after they got elected and are still alive and breathing, albeit at the cost of the citizens. It also gave the politicians a chance to divert the attention of the public from their ‘scam a day’ programme. Neither Ambedkar nor Nehru had objected to the cartoon and Shankar was such a revered cartoonist of those days. When people lose the capacity to laugh at themselves, they lose something precious than life. They lose the faculty to think freely. But seriously, except for a few publicity mongers, people did not bother about the controversy at all. Dr.Ambedkar stood for a just cause and he is great for the work he did for our country. This sort of reductionism of a great man to a mere caste leader is shameful and a great injustice to the man. Unfortunately, this is what is happening now. If the trend continues, Mahatma Gandhi will become just a Baniya leader, JawarhalLal Nehru a Kashmiri Brahmin leader and so on. People who pay lip service to Dr.Ambedkar are not bothered about the plight of the poor in the country. Even after independence of 65 years, even after reservations, even after all sorts of programme, the majority of world’s poor are in India and in that, the majority are the so called lower castes. The situation persisting now would have surely pained both Mahatma Gandhi and Dr Ambedkar, the faltering growth figures of a shining economy notwithstanding. K.K- If there was one question you wish were asked during an interview, what would it be? How would you answer it? A.N That would be lovely, if I could ask questions myself and answer them. How I have wished things would be that easy during my examinations. I hope this idea catches on so that at least the next generation will enjoy. One question I would love to answer is the person who influenced me most and that would be my father. He had instilled in my mind the spirit of free thinking and love and understanding our culture and mythology. Without either of these, Asura would not have been possible. K.K - What’s been the strangest reaction/comment you have seen or read about your book? A.N - Strangest reaction was from one reader in an online site. The person commented that though my characters looked very real and vibrant and my writing style was good, he would consider my work as plagiarism and laziness as I had used the characters of Ramayana instead of making my own epic. Calling six years of toil as laziness was alright. But calling Asura as a work of plagiarism was strange, to put it mildly. Asura is counter telling from the other side of Ramayana, the Ravana’s side. It has to use the same stock characters; else it would not make any sense. If Asura is plagiarism, then all the variation of Ramayana like Tulsidas Ramayana, Adyathma Ramayana, Kamba Ramayana etc are all work of plagiarism, since they all have been using the characters and events from the original Valmiki Ramayana. Even different retelling of our epics in various Indian languages, like Randamoozham by M T Vasudevan Nair, Mrtyunjaya in Marathi, the works of Micheal Madhusoodhan Dutta, and scores of others that have been done for thousands of years across our country in various Indian languages are all plagiarism of our epics by the same logic. K.K - Do you see yourself pursuing writing full time? A.N- Earlier people had only suspected that one or two screws were loose in my head. By now, the doubt would have been cleared in the minds of all the readers of this interview. Like me, some lucky abnormal people escape under the cloak of creativity and write stories or interview such nuts or review their books. Had I not redeemed myself by getting my work published, I might have perhaps now been staring at some bearded and bald psychiatrist mumbling nonsense to me. Instead, I am now enjoying a talk with a likeminded person, for which I should thank my publisher.